Local people dedicated to enhancing the future of our community. The Service Club of Andover is a volunteer organization made up of people like you, people who live or work in Andover and who want to give something back. Our members contribute their time and energy to ensure that two special groups of people achieve their full potential, thereby building a brighter future for themselves and a brighter future for our community. 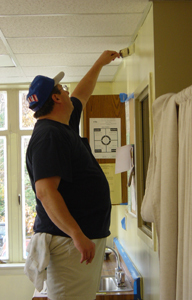 Helping our friends at the Professional Center with a little painting. We make a difference in our community by enriching the lives of our youth and individuals with special needs. While we sponsor a variety of activies aligned with our mission, The Service Club’s principle programs are the High School Mentoring Program, and the Adult Special Needs Program. Both of these programs seek to help individuals achieve their full potential and fulfill needs that would otherwise go unmet. Watch our videos for an overview of some of the programs that we support.